– It’s easier to contextualize the content during instruction than to modify the actual materials. Again, the danger of thinking of OER use as purely an educational technology enterprise–if a good near approximation is available, the instructor can simply convey any necessary information to students as they distribute the material. For instance, in distributing a problem set, the instructor can say, “We’ll only do every other problem here,” or “The last five questions are advanced applications not required, but you can do them for extra credit.” Same applies for issues of currency and culture. – There is value in showing students how the topic is taught elsewhere. I’ve seen cases both of educators giving their students MIT content to show how much more difficult materials are at a top school and to show that the level of instruction students are getting is at the same level. Either way, the use depends on not modifying the material. – Unmodified materials provide teachable moments. Multicultural literacy is going to be at least as important in many fields as technical skills. By providing students unmodified materials and leaving it to the students to understand the cultural issues, educators better prepare their students for working in the global economy, where information is not going to appear nicely localized. This is every bit as true (maybe more so) for students in the developed world as in the developing. I’m not suggesting localization will not be a vital part of OER exchange, just suggesting our thinking needs to be kept open to uses beyond localization. The logic with the formatting questions is that if the content were in a more manipulatable format, it would be easier for educators to make these changes. It’s a reasonable enough thing on the face of it, except that a) it’s hard to decide what is the best format for doing so, and b) every bit of effort expended on reformatting materials is effort that could have been applied to publishing something else openly. Heavy expectations for formats of OERs will also discourage a great many from publishing. I’d like to suggest that spending less time worrying about format might actually make OER more localizable, rather than less. In using OER–theoretically–you seek the nearest approximation to your need and then adjust along the four axes above. The closer a nearest approximation is to your need, the less work you have in localizing it. If the level of effort required to localize content exceeds the level of effort required to create new content, then educators will most likely roll their own. This would suggest that the more content you make available from as many sources as possible, the smaller the distance becomes to the nearest approximation for the most users. Format conversion of any kind makes OER creation very expensive. The more expensive it is, the fewer people will do it, and the less material they’ll be able to publish. This leads to a situation where a relatively few well-funded sources of content exist that then require, on average, a large amount of localization. Those communities furthest culturally, academically, and technically from the few sources will have the most localization to do, irrespective of format, so are most likely to left to create their own. On the other hand, if we just take what educators create, and publish as much as we can–and encourage as many others as we can to do the same–we’ll create a better network of nearest approximations. For example, I think we’re much better off with ParisTech publishing PDF engineering content in French, rather than setting the bar for OER publication at XML, not having a ParisTech OER project emerge, and then having to translate MIT content into French. Sure it would be easier to translate MIT content to French in XML, but isn’t it better (and more democratic and equitable and multicultural) to come up with open publishing norms that encourage wide participation, so that the materials are published in French to begin with? The down side, critics may say, is that then you have more materials of suspect quality being published. Maybe, but I’m of the opinion that the great majority of educators out there are decent, hard-working, intelligent people who create very useful content for their very local and immediate needs. I really don’t believe you get oceans of junk this way. If materials are published in association with an institutional name, then you have a good enough idea of their origin and likely quality, but more importantly the academic level of the material and the audience it was intended to serve. Content from smaller institutions will have a smaller sphere of influence than–say–MIT, but they will also be better nearest approximations for the needs of important adjacent constituencies that MIT does not serve well. Interestingly, this also allows educators themselves to decide what formats are best for their needs, in a free-market fashion. Over time, as educators themselves move to new formats, OER will keep pace with the change very nicely. 1) How do educators and learners access, identify and select OERs that meet their needs, and what barriers exist to doing so? 2) In what ways do they use OERs, what modifications do they make to resources to support these uses, and how effectively do the resources meet user needs? 3) In what ways do (or could) educators and learners make their own original OERs or derivative works available for reuse? Simply creating an accurate picture of how OERs are currently being used today will go a long way toward creating an exchange that is sustainable, inclusive, and that generates maximum benefit for all involved. I’m sure had I more time I could have been a little clearer and more focused, but I hope it’s a good start. Stephen Downes on Open Up! * He said this in passing, but I think it’s really worth thinking about more carefully: He described educational resources as being disposable. As opposed to the model of learning objects–intended to be durable and all-purpose–he describes learning resources as mash-ups of content brought together for a very specific purpose, and then made widely available to be mashed-up into something else. This is an ecology or economy rather than a storehouse (in the second part of the interview, as I’m typing this, he’s come back to the idea in more depth). As we begin to pull courses off OCW and replace them with new versions, I am more and more aware of the brevity of lifecycle for even these relatively stable resources. * He talks quite passionately about how educators can’t be expected to do extra work in producing open materials, and spends some time railing against the IP work in many projects as extra work that ought not need to be done. He also suggests that there is a body of volunteers out there who might be used to carry some of this load. I’m seeing a number of emerging models that include students, and am hopeful as well this might be more fruitful. Both of these points have implications for a number of nagging issues I’ve been noodling on, centered around what work ought to be done to resources as they get published openly. I don’t have time to do the kind of wrap I’ve done in the past, so I’m going to cheat and just throw up charts and pdfs of the web metrics I’m getting. 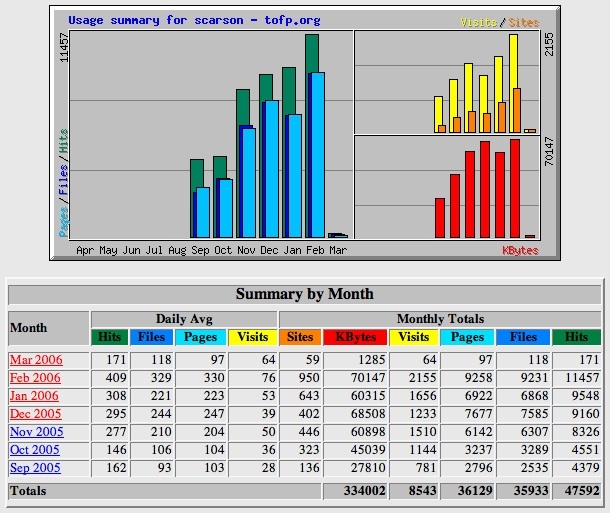 Good news for tOFP, with over 2,000 visits in February. July and August were lost in a server crash, but previous posts on the blog contain that data.